"Blooooonnnnnnnnnnnnndie! Dagwood Bumstead arrives home after a busy day at the Dithers Construction Company office, where Mr. Dithers threatened him with sharpening his pinkie in the pencil sharpener. But alas, our beloved architect is home eating a mile high sandwich and watching Daisy the dog chase her tail. Blondie is based on Chic Young's popular comic strip. 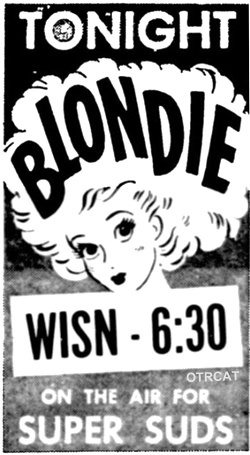 After becoming a successful movie, Blondie continued to be a hit in its old time radio show form. 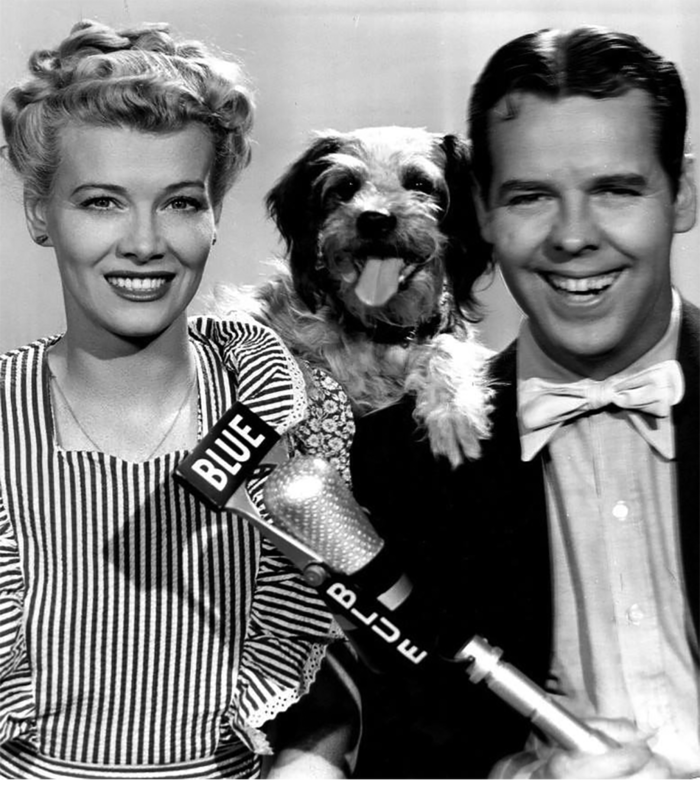 Arthur Lake, who was raised in a circus family, plays Dagwood Bumstead. 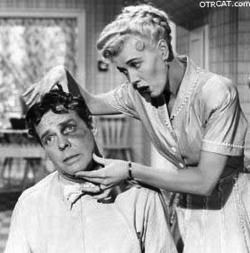 His wife, Blondie, is played by Penny Singleton, Ann Rutherford, Alice White and Patricia Van Cleve. Leone Ledoux, professional infant imitator, plays Baby Dumpling and later Cookie. Crazy antics ensue as Dagwood and Blondie go bowling, change fowl diapers, and try to put too much mayonnaise on Dagwood's sandwich! Although some of the older recordings have a crackle, it is great that the shows can be preserved to enjoy many, many years later. Keep up the good work! I know a lot of these shows are not the best quality, but you certainly give it the old college try! My daughter is legally blind and tapes and then CDs provided her with entertainment and learning. They were invaluable in her growth and now she visits an assisted living facility two to three times a month and plays old radio shows on a tape player. Today she is an expert doing many things using an Echo, especially listening to books. Who da thought. My impression is that AFRS shortwave stations did their best to mimic US radio station programming, offering a regular schedule throughout the day. Our USAF radar site in remote Alaska had its own AFRS AM radio station. It broadcast a regular schedule of programs from transcription discs. what\'s interesting is that this was a post-WW2 survey when there were mainly peacekeeping and rebuilding forces. my sense is that when WW2 was in process that Command Performance and some of the other AFRS-only shows would have gotten strong responses. After the war, and especially for families of those who may have been with service personnel, AFRS was their main English-speaking resource for all US media, with perhaps BBC shortwave as secondary for them. From my discussions with Thom Whetston who is expert at this stuff, even in the 1970s there were service personnel and families deployed in areas where there was no television service, so AFRTS broadcasts of OTR were very welcome to that audience. I guess in this particular case, I was envisioning a soldier in his barracks tuning in the shortwave, and how far fetched it seems to me for him to think “Oh boy! Blondie’s on!” Of course without AFRS, we wouldn’t have hardly any Blondie episodes at all, so I’m grateful for that. Blondie 430412 185 Blondies Trouble Arrives C.o.d.